If you are a fan of television reality shows, perhaps you’ve sat glued in front of the TV while one celebrity home show after another unfolds. Maybe you’ve found yourself getting jealous and thinking, “Why can’t my bathroom/bedroom/closet/kitchen look like that?” The truth is it can. Magazines often run spreads showing what outfits the stars are wearing, and how you can achieve that same look for less money. The same holds true for home remodeling. Find out how you can give your home a facelift by giving your bathroom a celebrity makeover. Your first step in giving your bathroom a makeover is to find a celebrity bathroom matching your space. You want to look for two factors — the size and shape of the space, and the ambience you want. There are several resources you can use to view popular celebrity bathrooms. You can also research bathroom remodeling trends online if you are uncertain what your favorite look is called. Jenny Craig. Wonder what greets weight-loss queen Jenny Craig when she steps into her most private space? An Italian renaissance theme hints at the decadence of a soaking tub, personal fireplace, luxurious step-in shower and overhead mural. Meg Ryan. With a beach theme and a back-to-basics antique tub made of earthenware, mega-celebrity Meg Ryan enjoys soaking and primping with natural light and rich oxygenated air courtesy of natural greenery. Courtney Cox. The “Friends” and “Cougartown” star opted for rich pewter velvet chairs, a master bathroom of ebonized white oak and custom pewter finishings. Yves St. Laurent. If you love Yves St. Laurent’s clothing, you might love the designer’s beautiful Moroccan-style bathroom, complete with sky-blue tiling, lattice windows, ornate wash bowls and simple furniture. Set your budget. This absolutely must be the first step you take in planning your bathroom makeover. Setting your budget will drive your timeline, the contractor you select and even whether you can do the project in its entirety or in stages. Select your contractor. Unless you happen to be a home improvement expert, you will want to hire one to oversee your renovation. 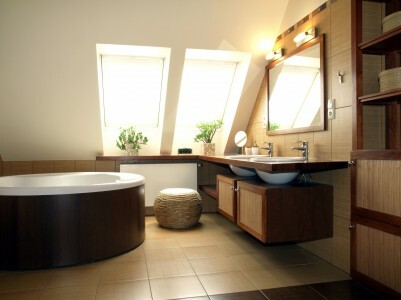 Bathrooms can be tricky with plumbing and lighting to consider. It’s better to hire an expert for the tough parts than realize too late you need help. Purchase the supplies and materials you need. Now that your budget and contractor are in place, order the necessary supplies and materials. Your contractor should assist with the ordering. Prepare your home. The remodel may only target your bathroom space, but it will impact your entire home. If you have a second bathroom, you may be able to live in your home while the remodel is being done. But if this bathroom is your only facility, consider staying with friends or family until the remodel is finished. Thoroughly spot-check the contractor’s work. Too many people who are new to remodeling fail to complete this step — to their detriment. Your contract probably states how long you have to report issues or errors. One “rule of the road” for nearly every type of remodel is that delays are common. Most often, any delay you experience will relate back to an unexpected issue that crops up only after the remodel is underway. This is common but may result in a delay. Build in extra time rather than risk getting frustrated because of a necessary delay. Enjoy Your New Celebrity Bathroom! Like weddings, births and those anxious first days at a new job, the initial process can be painful or frustrating. But if you are patient and persistent, allowing for each step of the process with careful planning, you will be rewarded with a wonderful gift — in this case, a celebrity look-alike bathroom to enjoy for years. About the Author: Karol Keener started her interior-design business at the age of 21. Today, she has remodeled the private interior spaces of some of the wealthiest people in the world.